Along with fellow Scot Andrew Carnegie, one of the most influential characters in the Industrial Revolution is Scottish Engineer James Watt. 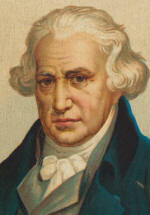 Born 1736 to a carpenter in Greenock, Scotland, Watt was originally trained as an instrument maker in London, England. Watt eventually returned to Scotland and was appointed instrument maker at the University of Glasgow. During his time there he met Chemist (and past Famous Scots feature) Joseph Black who was studying the heat properties of steam at the time. Also during that time, Watt was asked to repair the University's model Newcomen steam engine. During the repair however, Watt found many areas of the engine's design that he believed could be improved upon, specifically the amount of energy it wasted. Under the Newcomen design, a jet of cold water was used to condense the steam in the engine, unfortunately this also had the effect of cooling other parts of the engine, which then had to be re-heated. Watt believed this to be an inefficient use of energy that could be corrected. Over the next several years, Watt improved the design of the Newcomen engine, adding a separate condensing chamber in which the steam could be condensed without cooling the rest of the engine. This new design was nearly 75% more efficient than its predecessor, as well has having several other smaller improvements. He patented the condensing chamber in 1769 and in 1774 he went into business with Matthew Boulton to produce the improved steam engines. The first of these were used in collieries and iron works, and by 1783 Watt's engines had almost entirely replaced the Newcomen models. The more efficient (and therefore more cost-effective) new device made it possible for smaller "cottage" industries, such as cotton spinning, to become large factory industries, helping to make the Industrial Revolution possible. Even though the steam engine hasn't been used industrially for many years now, Watt's legacy has endured. Eight years after his retirement in 1800, he founded the Watt Prize at Glasgow University, which also named an engineering laboratory after him. And of course, there is the energy measurement unit called a "watt", a unit of energy equal to one joule per second (a joule being about the amount of energy it takes a person to lift a golf ball one meter, or the power dissipated by a current of 1 ampere flowing across a resistance of 1 oh, for all you physics types). James Watt died at Hatfield in 1819 at the age of 83 and was buried in Handsworth Church. A book about him titled "James Watt". written by Andrew Carnegie. was published in 1905.